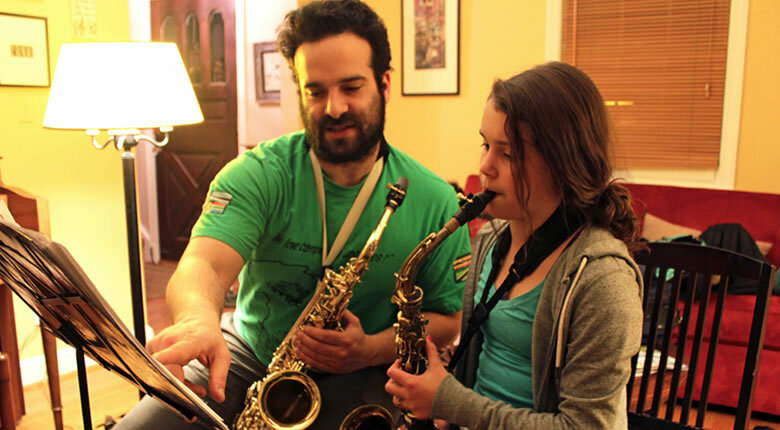 Ask your students to rent or buy an alto saxophone from a music store. Some reliable brands are Yamaha, Selmer, Jupitar, and Vito. If they are going to borrow form cousin Anne or Uncle Eddie they need to take it to a qualified repairperson. Mouthpiece-the Yamaha student model is excellent, Selmer has a decent product. Ligature-as long as it holds the reed on firmly it’s OK to start with. Reeds should be LaVoz Medium or VanDoren #2’s but Rico #2’s will be fine for the first few lessons. Each student must also buy a swab for the neck and mouthpiece of the sax as the body swab won’t fit those pieces. A clarinet swab works well. The neoprene, stretchy neck straps often seem unstable while playing. First they must get a reed in their mouth to soak. Particularly in the cold dry months of the year it can take several minutes to get the reed wet enough to where it’s not wavy along the tip. Secondly, they may need to grease the neck cork. It’s always good to have tissue nearby in case they get grease on their hands. We then gently twist on the mouthpiece so it’s covering about half the cork. The ligature goes on next and then comes the careful manipulation of sliding that reed in, without pushing on the tip. Once they’ve centered the reed and matched the tip of the reed with the tip of the mouthpiece we’re ready to snug up the ligature screws. Check to see that each student has the materials that you had indicated earlier. Cleaning out at end of lesson. Ask them to work at doing the same activities at home as many days as possible before the next lesson. Make sure that you methodically use the first pages of the method book to help reinforce what you show the student about tone production, assembly, posture, basics, maintenance, etc., as that will be their guide at home. They don’t take the proper amount of mouthpiece in their mouth! When they don’t take enough in and they get a wimpy, uncontrolled sound. If they take too much they have a honking quality. See above for balance. Poor reed care-it is so easy for a fragile reed, on a bulky instrument, to take a little shot. They simply must be careful with their reeds. That’s why they should be the first item out (into the mouth) and the first item put away. Reed placement-often, students don’t give themselves a chance for a good sound if they have their reed placed in a crooked fashion on the mouthpiece or if they don’t have it matched up with the tip of the mouthpiece. Neck strap adjustment-ask them to be very PICKY about how they adjust their neckstrap. The neckstrap should do ALL OF THE WORK of holding up the sax. No lifting the sax to your mouth. Use a tuner with them by about lesson 4 or 5. Their embouchures should be more stable by the time.